Dr. Joe Conroy, Fisheries Biologist, Ohio Dept. of Natural Resources, Division of Wildlife, Inland Fisheries Research Unit, Hebron OH Presented to the Clear Fork Chapter, Trout Unlimited – May 14, 2012. Conroy works with the ODNR DOW Inland Fisheries Research Unit, which is responsible for all fisheries in Ohio that are not living in or migrating to Lake Erie. In the mid-1980’s, DOW recognized the lack of cold water fishing opportunities in Ohio, but realized that was mostly because of the lack of ecological potential for a cold water fishery in the state. A research project was initiated from 1990- 1994 to prioritize streams in Ohio that might be suitable for stocking of brown trout. The purpose of the study was to assess streams for the probable success of a “put, grow, and take” brown trout fishery, in which trout would be stocked at 6-8” length and then grow to legal length for angler harvest. The idea was such a fishery, once established, would be continued long- term, so only streams that would support a healthy trout population would be considered for this program. Using available data, 39 streams across the state were selected for further consideration as possibilities for a brown trout stocking program. Criteria for further consideration were: 1) appropriate habitat and cover, 2) summer temperatures below 75F, 3) presence of native fish that might prey on or be affected by stocked trout, and 4) at least one mile of public stream access. Initially, four streams were found to meet these criteria, but two were subsequently eliminated due to limited public access. One of those eliminated was Apple Creek in Wayne County. Two streams were chosen to begin a brown trout stocking program. One was Clear Creek, in Hocking County, south of Columbus, much of which is located in the Clear Creek Metro Park. The second was the Clear Fork Branch of the Mohican River. Two sections of this stream were selected, one in Richland County, east of Bellville and above Pleasant Hill Reservoir, and the other in Ashland County, below Pleasant Hill Reservoir, most of which flows through the Mohican State Park. In addition to these two new streams, brown trout stocking was continued in the Mad River in Champaign County, south of Urbana, which had been successfully stocked with trout since the 1950s. These three streams have now been stocked with brown trout raised in ODNR DOW hatcheries since the mid-1990s. Stocking of 25,000 yearling trout, 6-8” in length, currently takes place in mid-October. Fish are stocked at 500 fish per mile of each stream in the program. Annual stocking rates for each stream are: Clear Creek (3,500), Clear Fork above Pleasant Hill reservoir (7,400), Clear Fork below the reservoir (2,600), and Mad River (11,500). Very little is currently known about the survival, growth, and movement of these fish following stocking. Thus, a 4-year research program was initiated in 2011 with a final report due in September, 2015. Aims of the study are to see how well stocked trout are surviving in the three streams, how fast they are growing to legal harvest size (12”) and beyond, and how far fish are moving from the point of stocking. Fish are recovered by electro-shocking along much of the length of each stream in late August, and data is collected on numbers and size of trout. In addition, all fish are being tagged by insertion of a tiny metal tag into the muscle at various locations on the trout’s body prior to stocking. This allows recovered fish to be identified as to where and when they were put in the stream. The first summer of data collection was in 2011, which happened to be the hottest July in the past 60 years. That put maximal thermal stress on the trout and revealed the ability of each stream to maintain summer temperatures that will sustain the trout. 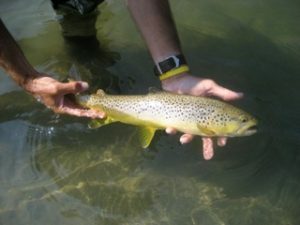 Brown trout can endure higher temperatures than rainbows, but there are strict thermal limits. The optimal growth temperature range for brown trout is 48-65F. Brown trout are stressed when temperatures exceed 68F. The “incipient lethal temperature” for brown trout is 76F. If stream temperatures exceed 76F, 50% of the population will die within 7 days. Temperatures were measured in each stream with data loggers placed in the stream in areas likely to stay the coolest. In July, temperatures in the Mad River never exceeded 76F, and rarely exceeded 70F. In Clear Creek, temperatures slightly exceeded 76F on 13 days. In Clear Fork above the reservoir, temperatures slightly exceeded 76F on 11 days. However, below the reservoir, temperatures in July exceeded 76F nearly every day (28 days). Unlike the other areas, river flow in this section is controlled by release of water from Pleasant Hill Dam. Survival of fish in the three rivers was determined by electroshocking in late August. When numbers of fish caught per hour were compared with numbers of July days above 76F for each stream, a clear relationship was found. Highest numbers of fish were counted in the Mad River, with intermediate numbers found in Clear Creek and Clear Fork above the reservoir. However, electroshocking resulted in no trout in the Clear Fork below the reservoir. In the Clear Fork, the highest numbers of trout were recovered near the Gatton Rocks area. Size of fish recovered ranged from 10-23”. Preliminary data indicate that the growth rates of brown trout vary among the three program streams. In most cases, it appears to take two years for fish to reach12-inches. Movement of fish from the point of stocking has only been monitored thus far in Clear Creek, where tagged fish were released at four locations in October, 2011. Fish were first sampled in February, 2012, prior to any thermal restrictions being established in the stream due to warm weather. At that point, it was found that most fish had only moved a few hundred yards from the point of stocking, either up or downstream. However, a few had moved as far as 5 miles, mostly upstream, showing there is great potential for movement to occur. This may be more significant when summer conditions affect stream temperatures, forcing fish to seek cooler water. Conroy indicated that he and colleagues will be continuing to collect data from the three streams throughout the seasons of 2012, 2013, and 2014, with the final report due in late 2015. They are making efforts to talk with interested groups, like Trout Unlimited chapters, to keep them updated on what they are finding and obtain feedback on their study. This research is being funded by Federal license fees and sport fishing excise taxes. Audience members asked several questions. In response to a question about fishing pressure in each river, Conroy said there is no good data available on fishing pressure. They are working to obtain some reliable data, but detailed angler and creel surveys are considered too expensive. One audience member said that his experience fishing Clear Fork below the reservoir indicated the presence of large musky there, up as far as the Covered Bridge in Mohican State Park. Little is known about any role these predators may play in trout survival in that section.